High-Speed Internet to keep you connected. With Van Buren Telephone’s Broadband High Speed Internet, you’ll receive fast speeds and a reliable connection. And our standard Internet service includes 5 e-mail addresses and 24/7 technical support. Businesses should call to inquire about our special multiple user Broadband high speed Internet service for LANs. Contact us today to learn more about our high speed broadband Internet service, or click here to learn about our packages! To receive high speed internet, you must have a NIC card installed in your computer and a DSL modem (available for purchase from Van Buren Telephone). Click here to view the Van Buren Telephone Company, Inc. High Speed Internet Acceptable Use Policy. Click here to view Van Buren Telephone Company, Inc. High Speed Internet Service Description, Performance Characteristics, and Network Management Practices. Tech Support is still here 24 hours a day, 365 days a year, answering the phone. You can call us anytime at 1-800-205-1110. Want to search through our Knowledge Base of solutions? Browse through Frequently Asked Questions that other customers have posed? Chat Live one-on-one with a Tech? Email Technical Support? Click here to access our Live Interactive Help Site! Can’t find what you’re looking for? Email us at esupport@netins.net with your questions. VBT Internet services are supported by netINS Technical Support. Computers who connect to the Internet are assigned a unique numerical address known as an Internet Protocol (IP) address. This unique address identifies each computer on the Internet so that computers can communicate with each other by sending and receiving information using this addressing scheme. A static IP address is simply a “permanent” address that remains associated with a single computer over an extended period of time. This differs from a dynamic IP address, which is assigned ad hoc at the start of each session, normally changing from one session to the next. Assignment is handled by a person’s Internet Service Provider (ISP). Every ISP is designated a large block of IP addresses that fall within a specific numerical range. The ISP server automatically delegates available IP addresses within that range as needed, to clients logging on to the Internet. When a person disables his or her Internet connection, the temporarily assigned dynamic IP address goes back into the pool for reassignment. Dynamically assigned IP addresses are fine for most people, however, some prefer a static IP address. Please contact one of our customer service representatives at 319-293-3187 for additional information regarding Van Buren Telephone Company, Inc.’s static IP service! Regular computer maintenance and protection saves you time and money — and can even protect you against identity theft. If you don’t continuously update your software, your hard drive won’t work. And if your computer crashes, you could lose everything and still have to pay for expensive repairs, or even a new hard drive. Even more critical is computer protection. If you don’t have the proper internet security software, your data is wide open to multiple threats. Viruses can wipe out your files and pictures, spyware can lead to identity theft and without a firewall, your information is left open to hackers. And with new viruses and spyware being created every day, if you don’t keep your software constantly updated, even with the proper software in place, you’re still vulnerable. 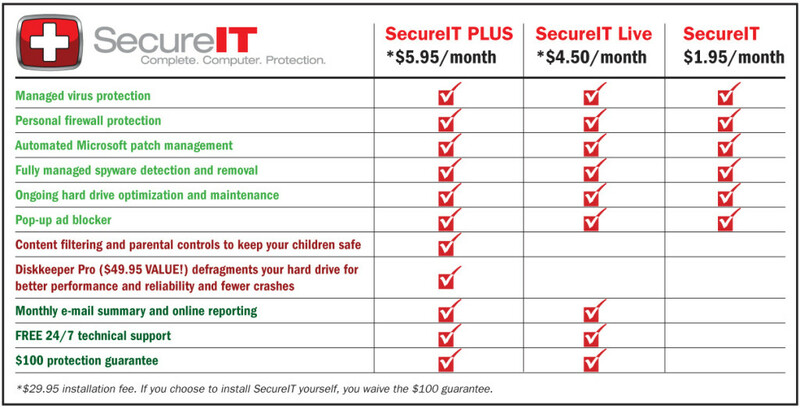 With SecureIT, you don’t have to worry about computer maintenance OR security ever again. You get a complete solution that is GUARANTEED for just a fraction of what you would pay for individual software programs, and without having to do a thing. And with SecureIT, you choose the level of service you need. SecureIT even offers professional installation! Browse the packages below (click the graphic to enlarge it), and call us at 319-293-3187 to get your computer safeguarded before it’s too late! Click here for more info on SecureIT and Frequently Asked Questions. Get online backup for easy online backup of your photos, music, documents, and more. Choose 50 GB or 250 GB of storage. Online backup has safe and secure 128-bit SSL encryption, the same protection technology used by banks today. It is automatic and reliable. Built to set it and forget it, or you can schedule specific times to back up and Online Backup does the rest. After the initial backup is complete, Online Backup only backs up files that have been added or changed, making subsequent backups lightning fast. You can install Online Backup on an unlimited number of computers and share your storage quota among multiple machines. You can even view and restore from computer to computer. 24/7 support by phone, chat, and e-mail is included at no extra cost. Click here for more information on online backup. 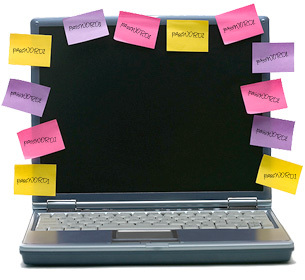 Ditch the sticky notes; let Password Genie remember them for you! Password Genie saves all of your website usernames and passwords so you never have to write them down again! Password Genie automatically remembers all your usernames and passwords on up to 5 computers, so there is no need to remember multiple passwords anymore. Eliminate all the written down and unprotected storage of your usernames and passwords. Password Genie stores information in an encrypted database that is protected by a master password. It’s just like magic! Once installed, Password Genie does the rest! You’ll never have to use the “Forgot Password” link and hope the e-mail comes through in a timely fashion (if at all). Password Genie is easy to set up and manage and offers 24/7 support if needed. Password Genie securely backs up your usernames and passwords so you never have to worry about losing them again.